Oil-free Indian Achaar recipes. Oil-free homemade pickle recipe. Oil, salt and sugar are the three most important ingredients added to pickles to increase their shelf life. However, overall most pickles are unhealthy because these three ingredients in excess quantity lead to ailments like high cholesterol, high blood pressure and high sugar. Relishing pickle sometimes in less quantity is an indulgence though. What if we tell you, we have an alternative similar to these tongue-tickling achaars. Pickled vegetables make a great oil-free achaar. The easiest way to pickle vegetables is to soak them in vinegar. Perk it up with some freshly chopped green chillies, peppercorns or kalonji. A kebab platter is incomplete without those crunchy, tasty sirkewala pyaz. Also, you can make oil-free pickles like Mooli ka Achar or Pickled Baby Onions and Garlic and enjoy them with piping hot stuffed vegetable paratha. During winters, when the market is flooded with fresh vegetables, stuff your refrigerator with bottles of these easy to make Green Peppercorns in Brine or Crunchy Vegetable Pickle. Mixed Vegetable-water Pickle, an assortment of fresh winter vegetables, fresh green garlic in tangy mustard flavoured water makes my mouth water just to think of it. Similarly, during summer you can pickle baby mangoes using any mango pickle recipe or they can be preserved in a brine solution. One of my favorite oil-free achaar is the Mustard Chilli Pickle. I eat it with thepla, ganthiya and other Gujarati delightful recipes. 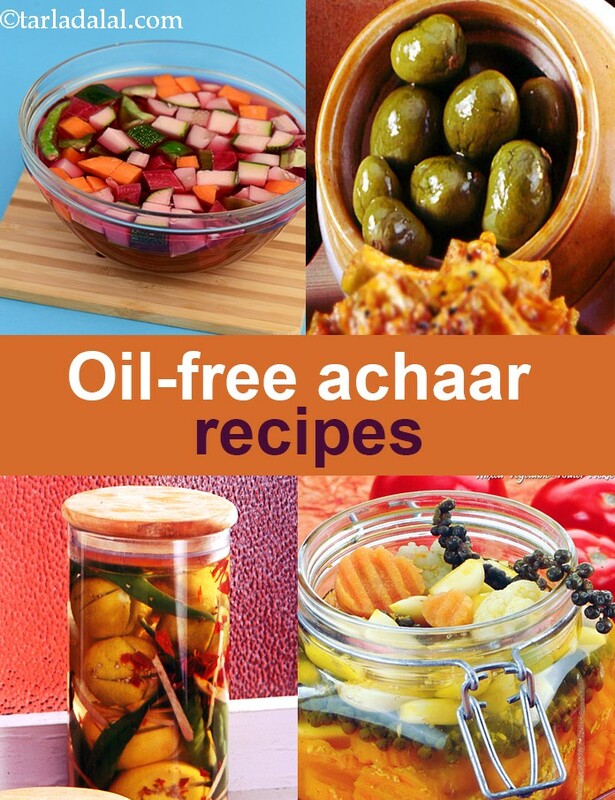 Enjoy our collection of 9 Oil-free Achaar recipes and surprise yourself with these unique recipes!